A combined insurance policy is ideal for businesses that operate from premises that are used as garages, MOT centres and car dealer showrooms. Often in one of these types of business there are expensive pieces of machinery, tools, stock and vehicles. Damage to the premises if they are either owned by the business or the lease states that the business is responsible for any repairs to the building. 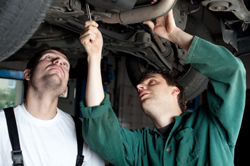 Tools that are required to conduct business as a motor trader. Contents contained on the business premises such as plant, fixtures and fittings and machinery. Personal possessions of employees or customers. Damage to any vehicles held at the business premises whether the vehicles be owned personally by the business owner or a stock of vehicles that are awaiting sale or repair. Employers Liability, Service and Sales Indemnity Liability and Public Liability. As you can see the combined insurance for motor traders insurance policy provides cover for so many things but it at least gives the business owner peace of mind in knowing that should almost any untoward eventuality occur there is cover in place. This is a very specialist form of insurance and it is important therefore that any motor trader considering such cover should be fully aware of what the policy covers in various situations. There are a number of insurance companies who offer such cover so you can compare quotes from a number of different companies via this site. Remember though, it is not just about getting the cheapest price it is also about obtaining the most suitable level of cover to meet the requirements of the business.